Courtesy of the first still of this year’s much-anticipated (by me!) 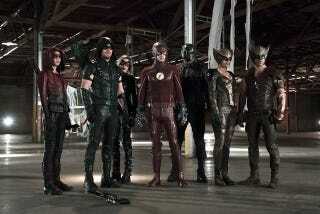 Arrow/Flash crossover, we have our first look at the Hawkpeople of the DC-CW-TV universe, in their Hawk-duds. It’s certainly an improvement over what Smallville presented, but suffice to say I don’t think the Hawk-helmet has been mastered in live-action quite yet. That’s Falk Hentschel as Carter Hall and Ciara Renée as Kendra Saunders. I’m curious to know what their wings will look like or how they’ll appear. Do they just shoot out of their backs, through their outfits, angel-style? The stills come with a new detail about the crossover episodes, which will air just before Thanksgiving—namely that Vandal Savage will be the foe that requires the Flash, Green Arrow, and an assortment of other heroes. Savage, of course, will be the main antagonist of the new DC-CW-TV series Legends of Tomorrow, so these seasons of Arrow and The Flash are continuing to basically be one giant set-up for that series. It’s not bad, but I also won’t mind when it both these series can get back to telling their own stories, either.